Awesome wall hanging. It answers a question we just had. Mary just bought a clothe art piece and we were wondering how to hang it. Thanks Marti. I’m happy it gave you an idea! Fantastic and oozing with class. I spray class like a fire hose. Droooool!!!! Nicely done!!! Here, here!!! Doozy is the perfect accessory for the photo shoot! I learned so much! Thank you! I will check out Spoon + Tamago! Seriously cool and very original! I’d totally hang that on my wall. Thanks! I’m really happy with the way it turned out. Beautiful! You’ve got such great taste. 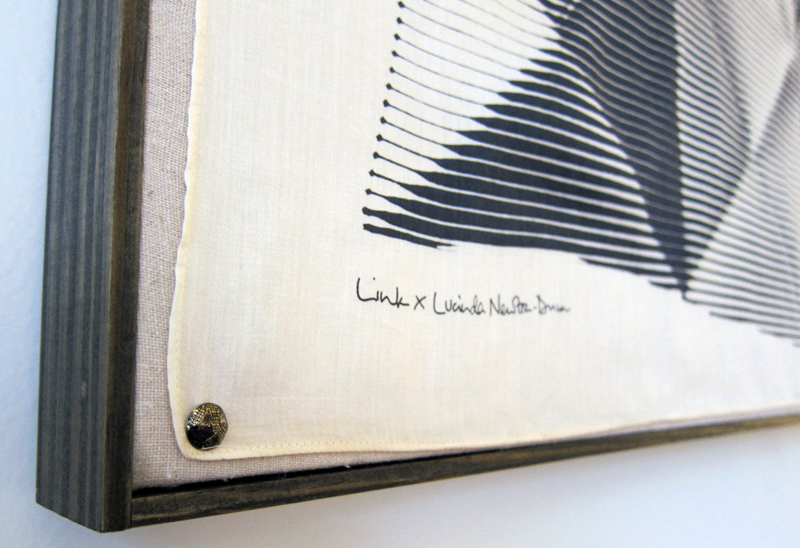 Your handmade picture frame with the Link’s furoshiki is fantastic! I am the founder of Ecoshiki http://www.ecoshiki.co.uk/, and selling Link’s furoshiki on my website. Would it be ok with you if I use the pictures of the furoshiki pinned on the picture frame in the lovely living room on Ecoshiki website?? Hi, Tomoko: Yes! Sorry for the delay (your comment got trapped by the WordPress spam filter). I’m so pleased you like my frame. You’re welcome to use my photographs – thanks for asking. Please credit me (Marti Palermo) and/or link back to projectpalermo.com, if possible. Nice piece! Very creative I like how you framed the scarf. Great Job! Great. Thank you so much on the tutorial. I have a canvas that needs a frame and you just showed me how to do it. I’ll never pay Michaels again. Is that a goldfish plant hanging on the window frame? How do you take care of it and keep it blooming and looking so healthy? And what kind of pot are you using–do you have to take it down to water it or does it catch the water? It is a goldfish plant – I love it! I don’t know if I have any great tips: it gets tons of sun in that window, I’m careful not to over-water (especially since that pot doesn’t have a drain hole), and I cut it back a bit occasionally so it doesn’t get too straggly. Really, I think the sun-drenched window is doing all the heavy lifting. this might sound really goofy, but i’m not super crafty and i’m a novice when it comes to getting art framed. is there any possible way i could pay you to frame my link scarf for me? i love the frame you created, and i’m not sure i am crafty enough to make the frame on my own. 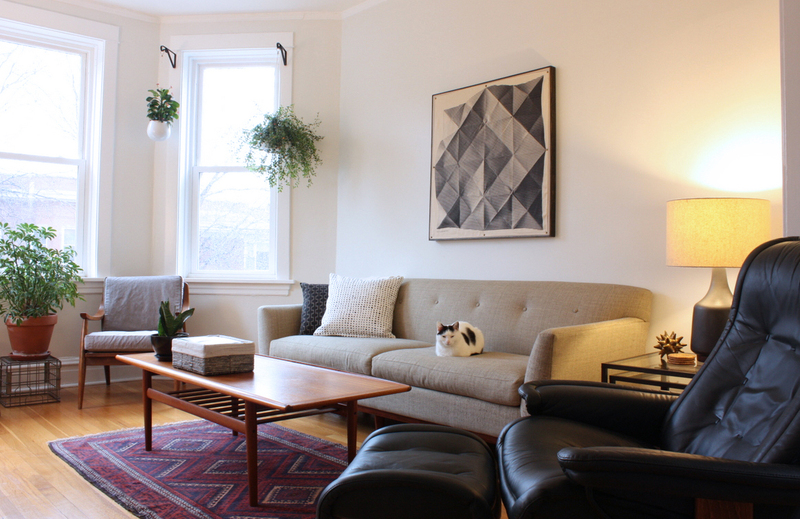 i live in logan square. let me know, and thanks! Hi, Mina: Sorry, just saw this! That’s a lovely scarf. I’ll send you an email about the frame! 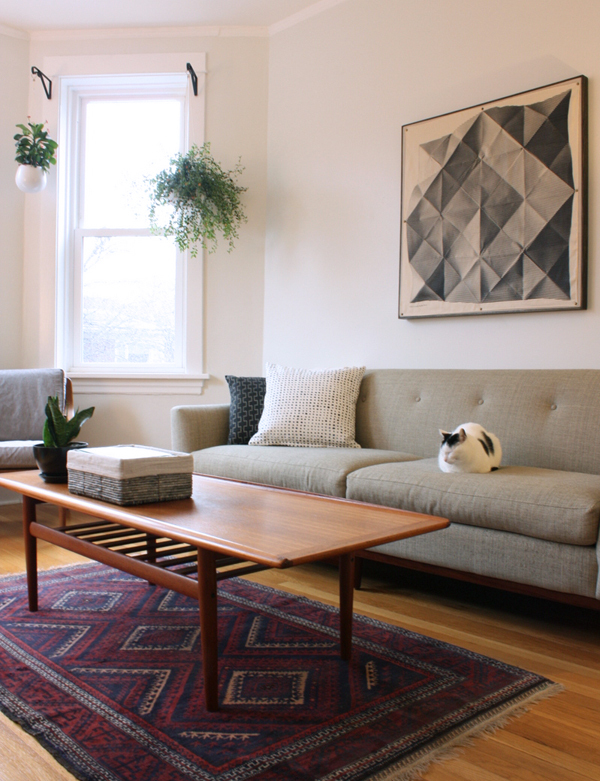 Great DIY artwork, and your living room looks so spare clean and lovely Your kitty is quite decorative, too! I do have a question: are there really no window coverings? I actually feel a bit vulnerable and exposed just looking at the photos!